Battlestar Galactica is the title of two television series produced by Universal Television: the first, broadcast on the American ABC network for one season beginning in September, 1978; and the second, first broadcast in 2004 on the SciFi Channel. Critically-acclaimed, the second version of Battlestar Galactica was given one of Time magazine's "Best of 2005: Television" awards. The basic plot outline of both series follows a conflict fought between the human race, as represented by the residents of the Twelve Colonies of Kobol, and a robotic race called the Cylons, created by a long-extinct reptilian race also called Cylons. Shortly after their creation, these Cylons, appearing as metallic robots, rebelled and slaughtered the original Cylons, then fought a long war against the humans. After great losses by humanity, an armistice was signed. Battlestar Galactica takes place after this armistice, as a peace treaty between human and Cylon is broken in an act of treachery, the Cylons gain the upper-hand as they destroy the fleet and decimate the colonies, and the surviving humans are forced to abandon their home worlds in a rag-tag collection of available ships led by the only surviving battlestar, Galactica. According to the series, Galactica is a warship about 2,000 feet long, heavily-armed with guns and missiles, and capable of launching several squadrons of “viper” fighters, as well as auxiliary shuttles. In the original series, Galactica was said to go light-speed; on the 2004 series this was accomplished via a “jump”. 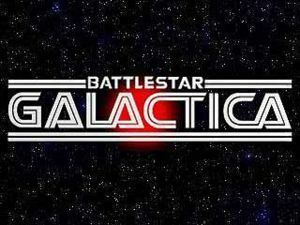 Battlestar Galactica first premiered on ABC as a three-hour pilot movie, September 17, 1978, with a total of 24 episodes. Heading the cast was veteran actor Lorne Greene as Adama, Richard Hatch as Apollo, and Dirk Benedict as Starbuck. Conceived and produced by Glen A. Larson, he envisioned the series as having "...a biblical feel. It ties in with Genesis, it ties in with the western pioneers. That's why we can do people stories even though we're in space. It's not a hardware show, although the special effects are magnificient [sic]" (Jerry Buck, The San Diego Union TV Week, September 17–28, 1978.). In fact it appears to borrow a number of themes from Church of Jesus Christ of Latter-day Saints (Mormons), of which Glen Larson is a member. Budgeted at more than $1,000,000 per episode, it was the most expensive television series to date, with most of the budget devoted to the special effects run by John Dykstra (Star Wars). The cost, plus it's 7:00 pm Sunday time slot opposite CBS' 60 Minutes, guaranteed the show's cancellation at the end of April, 1979. Glen Larsen attempted a revival in 1980 with this short-lived spin-off series, which premiered on January 27 of that year. Set some thirty years in the future, Galactica has found Earth, but discovers that it is less-advanced than thought, with no defense against the Cylons. Of the original cast, only Lorne Greene and Herbert Jefferson, Jr. reprised their roles, with Kent McCord (Troy) also providing continuity by giving an explanation early in the first episode that he was the adopted son of Apollo, Boxey. The series lasted ten episodes, the final one broadcast May 4, 1980. It has since been added to the 1978 Battlestar Galactica syndication package offered by NBCUniversal Television Distribution. Both Glen Larson and Richard Hatch have attempted for a number of years to get a revival of the series filmed, succeeding in 2004 with a show that quickly became known for its gritty, realistic drama as well as a faithful remake of the original series. Among the immediate changes in the new series were the names: “Apollo”, “Starbuck”, “Athena”, and “Boomer” - given names in the original series - were reduced to “call signs” similar to fighter pilots in the U.S. Military, and replaced with familiar surnames. British actor Jamie Bamber was cast as Captain Lee “Apollo” Adama; Katie Sackhoff was given the role of Lieutenant Kara “Starbuck” Thrace ; and Grace Park was cast as Sharon “Boomer” Valerii. Leading the cast was Edward James Olmos, a veteran actor who was best known as the brooding police captain Castillo in Miami Vice during the 1980's. In the main plot of the show, the Cylons return to destroy the human race. However, the Cylons have evolved - or developed themselves - to appear human. Using various sleeper agents, they permeate the Twelve Colonies and bring about a massive surprise attack. Twelve billion people are killed, and the 50,000 or so remaining humans retreat, the small ragtag civilian fleet protected by Galactica. The first season describes humanity's escape from the Twelve Colonies after the Cylon attack. The second follows humanity's attempt to forge a political system within the fleet, ending in a presidential election and the settlement of a new planet, well-hidden from Cylon detection. The third season covers humanity's recuperation from the fall-out from both of these events, and the search for the elusive "Thirteenth Colony," Earth, a world shrouded in mythology, which the humans believe will be their safe haven from the Cylons. The third season also significantly develops the prophetic plotline, and reveals a great secret of the show - the identity of four of the Final Five Cylons. The fourth and final season, now on its midseason break, has focused on finding Earth, Starbuck's destiny, and the identity of the final Cylon. Common themes involve the topics of prophetic religions in society, the tension between liberty and safety in a world riddled with terrorism, interfamily conflicts, and the meaning of "survival" after a catastrophic event. The show can be noted for its use of reduced (but not entirely muted) sounds in space combat - an artistic flourish that, while more accurate, has been absent from mainstream science fiction like Star Wars or the Star Trek series. It is thought that the producers of the show drew heavily from Joss Whedon's short running television show, Firefly, which muted all noises in space scenes. The style of the space scenes also shares some similarity, probably since Zoic Studios did the visuals for both series. Adama: Adama is the commander of the ship called Galactica. This also means he is the commander of the entire colonial military in all of the Battlestar Galactica series. In the Original Series and the 1980 version he was also a member the Quroum of Twelve that was the colonial government. In the 2004 series his name was changed from Adama to William Adama. Starbuck: Starbuck was a male fighter pilot in the Original Series and a female fighter pilot in the 2004 version. In the 2004 series she also became a field officer. Her real name is Kara Thrace; "Starbuck" being a callsign. Boomer: Boomer was a male fighter pilot in the Original Series and a female raptor pilot in the 2004 series. In the 1980 version he took on the role as the executive officer (second in command) of the Galactica. In the 2004 series she was once again a fighter pilot and mechanic. Her real name was Sharon Valerii; and used the callsign Boomer. She was later found to be a humanoid Cylon sleeper agent, although being a sleeper she did not realize this herself until, fulfilling a trigger, she shot Adama. Another copy of Sharon was found by Helo, a pilot trapped on Caprica after the attack. She helped him escape, falling in love with him in the process. Being a Cylon she was imprisoned when the pair rejoined the fleet. She helped the fleet avoid Cylon attacks, and rescue other refugees from Caprica. She became pregnant through an premarital relationship with Helo and gave birth to a Cylon-human crossbreed. After some time, this Sharon was accepted back into the fleet, with the callsign "Athena". The Cylon number of the Sharon models is 8. Apollo: Apollo is Adama's son (in all series). He was a fighter pilot, although in the 2004 series he advanced to command his own ship, the Pegasus. In the 2004 series he is named Lee Adama, with "Apollo" being his callsign. Apollo has a bad relationship with his father, and while they love each other, they are often at odds over philosophical differences. Tigh: Tigh is the executive officer for the Galactica in the Original and the 2004 versions. In the 2004 series he is named Saul Tigh. In the third season finale, he discovers that he is a Cylon humanoid, like Boomer. Baltar: Baltar is a traitor to the colonials. In the original series he was a member of the Quroum of Twelve, who helped the Cylons attack the colonies. This was used for his personal ambition to rule over Cylons and humans. However he had to escape the fleet and join the Cylons as the commander of a Cylon basestar. In the 2004 version he was a scientist named Gaius Baltar, famous on Caprica for his brilliance and charisma. He created a defense grid around the twelve colonies that the Cylons were able to hack; this was not a flaw he introduced, but instead the result of his seduction by a humanoid Cylon (number 6). He did what he could to keep this secret, and in fact rose to vice presidency, and finally the presidency. During his brief presidency the fleet built a city on New Caprica. This was assaulted by the Cylons and Baltar was forced to sign the surrender of the colonies. When the people from New Caprica were rescued, Baltar was taken with the Cylons, only to be recaptured later and forced to stand trial, as the truth of his involvement in the destruction of the colonies was revealed. Six: The Six-model Cylons appear as tall, slender, and very beautiful women, often sexually aggressive. Most commonly blonde, their hair can be any color. A Six seduced Gaius Baltar, allowing herself to insinuate code into the Colonies' defense systems that allowed the Cylons to shut them down remotely. A Six that only Gaius can see, hear, and feel has been his constant companion almost since the destruction of the colonies. Her exact origin isn't known, but she calls herself an "angel sent by God" to protect and instruct him. ↑ The Religious Affiliation of Glen A. Larson (Adherents.com). This page was last modified on 26 September 2018, at 08:46. This page has been accessed 7,670 times.